Around Annapurna Tilicho lake is top first most popular trek destination of Nepal, a rich diversity in culture with flora and fauna. The length of Annapurna round with Tilicho lake route varies between 160–230 km (100-145 miles) and offers a great Himalayan scenery of Mt. Dhaulagiri (8,167m), Mt.Annapurna Ist (8,091m) Mt. Manaslu (8,163 m), Mt.Annapurna II (7937 m.), Mt.Annapurna III (7,555m), Mt.Annapurna IV (7,525m), Mt.Annapurna south (7,219m), Mt.Nilgiri (7,041m), Mt.Fishtail (6,998m), Mt.Hiunchuli (6,441m), Mt. Lamjung Himal (6,986m),Tukuche peak (6,920m), Tilicho peak (7,134m). Furthermore trek around Annapurna combine with Tilicho lake excursion you can see the settlements of diverse communities such as Chhetri, Tibetian sherpa, Thakali, magars, Tamang, and Gurung. Trek to Tilicho lake offers a breathtaking view of the Annapurna range. Not only this but also you can see some wild animals such as Mountain Thar/ Goat, Leopards, Jackal, birds such as pheasant, long-tail birds among others. Two mighty river valley called Marsyangdi in the east and the Kaligandaki in the west is another attraction of this trek. Annapurna round with Tilicho lake is also a part of the great Himalayan trek (GHT) in Nepal. Kaligandaki is the world’s deepest gorge surrounding with Dhaulagiri and Annapurna Mountains. 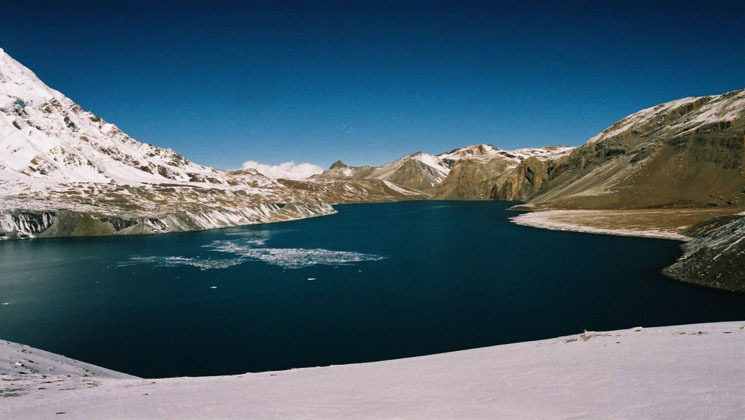 Thorong la is recognized as a widest pass located at an altitude of 5,416m / 17,710 ft above sea level. Due to the difficulties of crossing the pass, the circuit is usually walked in a counterclockwise direction. Traveling clockwise the longer ascent and shorter descent from west to east is too much for many peoples to manage in one day. Around Annapurna with Tilicho lake trip can be done any time throughout in any time (except winder) of the year. This is a classical trek with 12 days itinerary compared to most walks in this region. The particular route is designed for world travelers who wish to hike in around Annapurna inclusive highest lake ticlicho with relaxing manner itinerary however if you are planning with limited time wise than take a look this special itinerary on Annapurna Circuit short trek – 10 Days is the best choice. Day 02 Drive to Besisahar by bus (760m/2,485 ft), 7 hours. Early morning, Gokyo treks and Expedition’s experienced guide will come to take you at your hotel at 7.00 am then taking a taxi drive to Gongabu bus station. We take a Micro Bus takes about 7 hours to reach Besisahar town. As you are in Besisahar, you have some stunning snow-capped mountain scenery. Then we take a local bus or local jeep to Syange village where we stay overnight at guest house. Day 03 Trek to Bagarchhap (2,160m/7,063 ft), 5 hours. The rocky mountain trails following the Marsyandi Rivers steadily uphill to Tal at 1675m, the first village in the Manang district. We make a trail verse crossing a wide, flat valley. The journey continues up and down to Dharapani at 1890m. A stone entrance chorten typical of the Tibetan influenced villages. Upon reaching Bagarchhap at 2160 m the typical flat-roofed stone houses of local Tibetans design along with the village surrounded by apple Orchards and maize fields. Overnight at Guest house. Day 04Trek to Chame (2,630m /8,600 ft), 5 hours. The trail climbs to Tyanja at 2360m, then continuing through forest, but near the river, to Kopar at 2590m. Chame village reds the fine views of Annapurna II as you approach Chame & two small hot springs by the town. Along with this route we are introduced to a local community said to have migrated from Tibet a long time past, noticeable by their different features. With them, they have bought local Tibetan house designs and maintained their ways. Overnight at Guest house. Day 05Trek to Pisang village (3,300m/10,791 ft), 5 hours. The day starts through deep forest in a steep and narrow valley, crosses a river on a long bridge at 2910m. Then we cross another bridge at 3040m, from where the view of the soaring Paungda Danda rock face really begins to appear. From there the trail joins to climb to Pisang, which sprawls between 3200m & 3300 m. in the late afternoon, visit upper Pisang for Managers and their lifestyles and as well as an amazing Himalayan view. Overnight at Guest house. Day 06Trek to Manang (3,540m/11,576 ft), 8 hours. The trail leads you through the drier upper part of the Manang district, cut off from the full effect of the monsoon by the Annapurna Range. People of this region herd the yaks & raise crops for part of the year. They also continue to enjoy special trading rights gained way back in 1784. Leaving Pisang, we have alternate trails north and south of the Marsyandi River. The southern route passing over Humde airport is easier compared to northern route via Ghyaru. The upper route offers you outstanding views on trail that follows the northern bank of the river. From Mungji the trail continues past the picturesque but partially hidden village of Braga at 3475m to nearby Manang at 3540m. Overnight at Guest house. Day 07 Acclimatization day at Manang Village. Acclimatize day in Manang. Hiking and village excursion is not compulsory. However, we recommend you to spend doing some fine walks and over viewing the magnificent views around the village & the day time is best to gain altitude. At the end of the day, we return back to our accommodation & have a night rest. Overnight at Guest house. Today is tough day as we walk through the landslide and narrow trail to Tilicho base camp but the journey offers an excellent landscapes and white mountains makes trip more joyful. Stay overnight at Guest house. Day 09 Hike to Tilicho lake (4949m/16,183 ft) and discover around. Then descend down TBC. Heading up the valley we traverse through older moraine and as we reach on the lake than you will have tremendous views of Tarke Kang, Khangsar Kang and Gangapurna to the South as well as an impressive view over Manang and towards Pisang. Stay overnight at Guesthouse in tbc. Day 10Trek to Yak Kharka (4,050m/13,244 ft), 4 hours. As you descend, the trail leads over the Marsyangdi valley and the landscapes change in surroundings can be noticed as the trees are left behind and replaced with more alpine vegetation. Trek continues through the ruins of the old Khangsar village until we cross a log bridge over the river near Gumsang. Crossing river you ascend to yak kharka where a lot of yaks can be seen grazing and standing around with the grand view of Annapurna III. Overnight at Guest house. Day 11Trek to Thorong Phedi (4,450m/14,552 ft), 3 hrs. After ascending for two hours the trail descends to cross the river at 4310m, then we climb up to Thorong Phedi at 4450m. There are good guest houses and offers very good foods, Bakery as well as Internet and telephones are also available here. Overnight at Guest house. Day 12Trek to Muktinath (3,800m/12,426 ft) via Thorung La pass (5416m/17,710 ft), 8 hours. We begins our journey from very early in the morning. At sunrise, as we need to set out early to complete the crossing of the Thorong La at 5416m. The trail is steep right from the start, but with a slow and steady pace, we should reach the summit within three hours. Prayer flags and hot tea await us as we reach the highest point of our trekking. Our descent to Muktinath is long, but the views of border Himalayas and Dhaulagiri family are simply amazing. Muktinath is a large settlement with several lodges to choose from. Hot showers and a good meal will allow for a quick recovery after today’s long and difficult excursion. Overnight at Guest house. Walk through the dry and desert landscapes to reach Kali Gandaki river bank than you walk over the sandy and windy road to Jomsom where we stay overnight in a hotel. Jomsom is a tiny town and the district headwaters of Mustang district. During the afternoon, you might also hike to Jomsom eco-museum. From the museum, you will have also the best panoramic view of Mount Nilgiri North (7061m. ), Nilgiri Central (6940m. ), and Nilgiri South (6839m. ), Annapurna I (8091m. ), Dhaulagiri I (8167m.) and Tukuche peak (6920m.). Day 14Drive (9 hours) or fly (25 minutes) to Pokhara city. The trail descends all the way downhill through forests, tiny thakali villages and beautiful Rupse waterfall. The first part of the trek passes through the windy area covered with pine forests, rhododendron forests and birches are seen. The surrounding area of Ghasa is a famous destination for bird watching and wild Marijuana. Than the Kali Gandaki valley is getting narrow however we drive continue passing Tatopani, Galeswor, Beni we reach at Baglung highway to drive to Pokhara. The whole journey takes roughly about 9 hours. However, if you don’t like drive than you can take a flight as an optional paying an additional cost USD 90 for each passenger. As you arrive in Pokhara we transfer you to your hotel. How much is the Around Annapurna Tilicho lake trek cost? Hike to Around Annapurna Tilicho lake is available now on USD 1,225 per person is standard trek price on double occupancy basis. And of course, the trip price will vary according to group size. Taking flights to and from Pokhara saves your time and riding the bus reduces the trip expenses. For the deluxe and luxury trekking tour plan, we add the Pokhara – Kathmandu round trip airfare, 3-star category hotel deluxe air-conditioned room in Kathmandu (BB PLAN). Likewise, 2-star hotel standard accommodation in Pokhara (BB plan) with attached bathroom while on trekking on possible places. AND WE ARE OPEN TO CUSTOMIZE YOUR TOUR AND PACKAGES PRICE AS PER YOUR REQUIREMENTS. International tour leaders are highly encouraged to get discount and attractive complimentary. Jomsom to Pokhara transfer by Bus / jeep (Collection basis). We can organize private Around Annapurna Tilicho lake Trek starting at any date that works for you. Please contact us for more information. Question: Do I need the experience to do Around Annapurna Tilicho lake trek? Answer: Normally not but it is suitable for keen trekkers/walkers who are able to walk around 4 or 5 hours a day with a lightweight daypack. For this trek, if you have about the little experience would be better. Question: What kind of accommodation can I expect on Around Annapurna Tilicho lake trekking? Question: What kind of food can I expect in Around Annapurna Tilicho lake trek? Question: What opportunities will I have for a shower along Around Annapurna Tilicho lake trek? Question: How do I get drinking water on Around Annapurna Tilicho lake trek? Is there any communication facilities on Around Annapurna Tilicho lake trek? No! So, for the trekking routes, you need to have cash Nepali rupees because credit cards work only in the bigger city areas. Question: Who will carry my luggage on Around Annapurna Tilicho lake trek? Answer: We provide porters to transfer your luggage. As we are a responsible trekking tour operator agency, each of our porters carry the maximum of 25 kilos of your backpack which means 2 guests (12.5 kg luggage of each guest): 1 porter basis. Answer: Yes ! Of course. Annapurna circuit trekking is also known as around Annapurna trekking. AC trek is short cut form of Annapurna circuit trekking. The Pilgrimage town of Muktinath, Typical Eco Museum in Jomsom, Views of Dhaulagiri Ice – fall, The world deepest gorge in the Kali Gandaki River. Annapurna Circuit with Tilicho lake trekking ! Ammar Raj Guni is a perfect and very reliable agent for arranging your trekking. He has also much experience as a guide, so he always knows where he is talking about. His prices are really competitive. His calculations were transparent, our trek was some days longer then arranged, but at the end we got no unexpected costs. He works with local people from the small villages and he treats them very socially. So during the two days we stayed at his house, we felt ourselves very comfortably. I strongly recommend his agency if you’re visiting Nepal. – Janthima Chotis, Bangkok, Thailand.